My son Garnets grade 3 class was doing a civics exercise this week. They each wrote a letter to BC Premier Gordon Campbell. 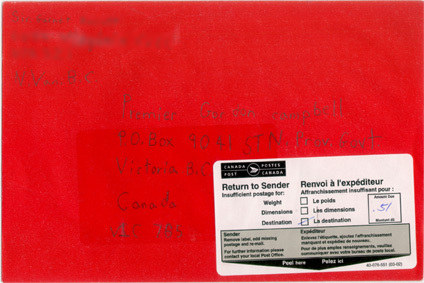 Garnets teacher told him that since the letter was going to the Premier, he didnt need to put any postage on the envelope. Ive always known that you can send letters free of charge to federal politicians. I dont recall hearing whether you can do the same with provincial politicians  but apparently not. Garnets bummed. And who can blame him. I mean, look at the care he took addressing the letter. His lesson in civics now includes that there is a world of difference between provincial politicans and the feds.